Engineering is the area of a starship that oversees the operation of the ship's propulsion systems and coordinates maintenance. Please note that these descriptions match the standard model of the Engineering layout depicted and may not match the preferences of individual Chief Engineers. Due to the small size of most Class 1 vessels, Main Engineering on these vessel types are typically categorized as being small, cramped sections of the ship were function super secedes comfort. A two level room, the upper level of a Class 1 Engineering Room contains to configurable workstations that can be set up for a diverse series of functions depending upon the need of a vessel's Chief Engineer. The lower level, accessed by a ladder or two entry doors in this section, features the primary workstations of the Engine Room. The Warp Core has been installed on an elevated platform in the center of the compartment and is opposite from the Chief Engineer's workstation. This large workstation, which takes up the entirety of the forward bulkhead, features seating for two additional workers aside from the Chief Engineer should her or she require additional assistance to meet the needs of the ship. Along the Starboard wall a large Master Situation Monitor provides up to the minute details on the status of the vessel while the workstation on the opposite bulkhead is assigned to monitor the Warp Drive and the Impulse Drive jointly. A multistoried facility, a Class 2 Engine Room is slightly larger than a Class 1 Engine Room yet features fewer defined workstations for personnel. 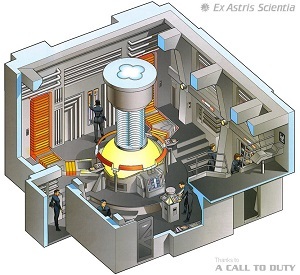 Located in the center of the room, the Warp Core provides operational power for all shipboard systems and is closely monitored by the Chief Engineer from the dedicated Chief Engineer's Workstation built into the railing surrounding the Warp Core. The aft section of the Class 2 Engineering Room houses the engineering computer bay and features an emergency isolation door that lowers into place to separate Engine Room from the rest of the ship in the event of a radiation leak or pressure loss. 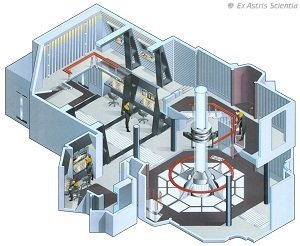 Class 3 Engineering Rooms are large, two story facilities centered around the vessel's Warp Core. On the lower level, adjacent to the Warp Core, is a large work area featuring multiple workstations assigned to monitor the systems of the starship. Adjacent to this area is the Chief Engineer's office and opposite this is a dedicated Engineering Lab that mirrors the Chief Engineer's Office and provides a work area for special projects or situational analysis. A small, single-person elevator, as well as a ladder provide access to the second level catwalk, a large area that provides additional workstations for systems analysis. The Master Situation Monitor is located on this level and is built into a large workstation that overlooks the Warp Core itself. Surprisingly small for its function, the Class 4 Engineering Room features two main levels and features an open floor plan that makes it directly accessible from the corridor. Despite this, in the event of an emergency such as a Warp Core Breach or Intruder Alert being sounded an isolation door will go into place to restrict access to this section of the vessel. The Master Systems Display and Master Situation Monitor dominate the main section of this room and provide operational control and analysis of all shipboard systems. Adjacent to this area is the Chief Engineer's office and several support consoles for monitoring the Warp and Impulse Drive. Beyond this is access to the Warp Core itself and maintenance systems for the Core. Both a ladder and elevator are available in this area to provide personnel access to the upper level of Engineering and the computer monitoring workstations. 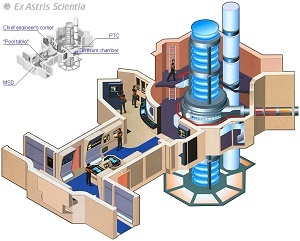 The largest Engine Room in Starfleet, the Class 5 Engineering Room is a three tiered compound that provides detailed monitoring of every system aboard a starship and features a similar open floor plan layout as the Class 4 Engineering complex. The largest work station is the Master Systems workstation that is utilized to monitor the status of all systems aboard the Starship. Surrounding the Warp Core itself were multiple independent workstations that could be reconfigured to serve any systems monitoring function or even replicate the abilities of the Bridge workstations. Multiple workstations built into the bulkheads provide detailed updates on the overall health of the ship. 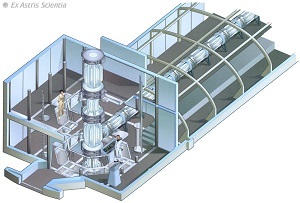 The second and third levels of the Class 5 Engine Room provide mission configurable panels to monitor a wide variety of systems and investigations. Access to these areas were provided by ladders and a complex elevator system. The Jeffries Tube network could be entered through multiple access points in this compound. The Slipstream Engineering Room has been designed to offer maximum oversight of the Quantum Slipstream Drive and associated components. Unlike the other Engine Room layouts, the current layout used for Slipstream Engineering is uniform throughout Starfleet regardless of vessel classification. The room itself is two tiered and accessed by a single entry on the lower level. In the center of the room is the Slipstream Core, which is circled by a metal walkway that helps to isolate the Core from the rest of the room. 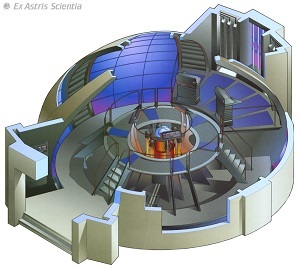 Three workstations have been installed into the railing that circles the Core and are presently assigned to oversight of the Propulsion Systems of the craft. Two additional workstations are located along the rear bulkhead and face inward toward the core. Engineering is the heart of a Starship and is one of the most common locations featured in our role playing games. 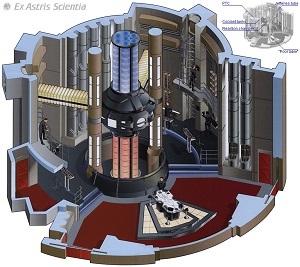 A special thanks to Ex Astris Scientia for their detailed gallery of Starship Interiors.